Dans le cadre d'une Marketing canvas, il est important de démarrer le processus à partir d'une question claire et simple basée sur l'ambition que vous souhaitez atteindre à l'aide de votre stratégie marketing. Une vidéo simple pour expliquer ce concept. Vos clients sont peut-être dangereux pour votre croissance? Pensée du jour sur la tension qu’il existe entre les clients et l’innovation. Sont-ils antagonistes ou non? Les clients peuvent-ils être dangereux, ce qui est assez illogique pour un marketer? Start with a clear ambition, S.M.A.R.T. and linked with the finance. One of the usual mistake when doing a marketing strategy exercise is to not properly link the marketing actions with the financial consequences. In the Marketing Canvas exercise, we genuinely start from the financial ambition for addressing this issue. This ambition is about growth and thus the canvas is about growth hacking your marketing strategy. Start with a clear persona representing a customer cluster sharing the same Job To Be Done (problem to be solved by your offer). It could happen that you can't achieve your ambition with your current persona/segment (in classical strategy, it corresponds to a cash cow or a future dog). If it is the case you should consider another segment with another job to be done. Assess the current situation of your marketing mix by asking the 28 questions as defined in the canvas. Define clearly if each dimension TODAY is helping you to achieve your ambition (it is an accelerator) or is not (then we define this dimension as a brake). Do this exercise in team as it will create a shared understanding of the situation and support your answers with facts. Backward thinking is a very powerful way of finding solutions to any problem. In this process, try to visualise/imagine how dimension(s) defined as BRAKES would look like if they would help you with your ambition. What is different? Could you describe it? Does it really help with your ambition? If yes, then you have one idea of potential solutions. Find as many ideas as possible. Having generated plenty of ideas (some could even be yellow ideas aka impossible ideas), you should prioritise it in order to finalise your preferred vision of this future where your ambition is achieved. What are the actions you should do to transform this future into a reality: Start Doing, Stop Doing, Do More, Do Less, Simplify, Magnify? Brainstorm as a team and list all actions. You now have identified all actions for building your future but you have to organise it into a comprehensive and feasible roadmap. Some actions are low hanging fruits while others require more time and effort. One way to do this is to use these 2 criteria: contribution to the ambition and effort. Congratulations, you now have a roadmap and a marketing strategy. 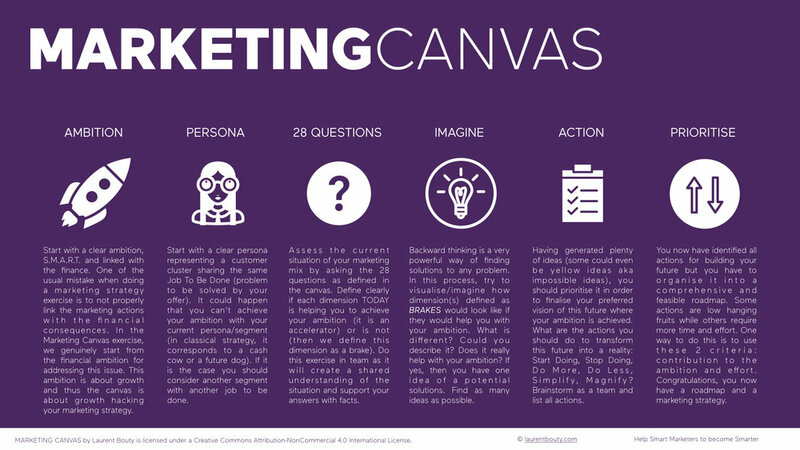 Marketing canvas is an easy yet powerful tool you can use for assessing your Marketing Strategy. It works for small and very large companies. It can be used by novices or experts. A list of key questions to be asked can be found in this article. Enjoy! Please find below a video about the Innovation Bootcamp I co-created and facilitated with Solvay Brussels School for a great Belgian Company (they built the highest tower in the world in Dubai). Great team, great people, great energy and fantastic ideas. List of resources (books, articles, video, website) that I recommend you to visit if you are interested in the Customer Experience topic. I am using these resources during my classes @SolvayBrusselsSchool and during workshops. Job To Be Done is the first concept you should explore in the Marketing Canvas. It is under the Human category. It helps you to understand if you really know the people that are buying/using or might buy/use your products and services. We are entering in a new world, Are you ready?